Residing about an hour east of Redding, California. Hat Creek is an amazing place to fly. The ridge is a west facing volcanic rim between the amazing vistas of Mt. Shasta and Mt. Lassen. Glass offs happen in the late evening when the winds can die down to a tolerable velocity for the paragliders to fly. Mid-day thermal flying is well beyond the scope of most paragliding pilots, even the Hang Gliders rarely fly in the afternoon during the summer season. The trees that surround the LZ are as tall as 80 feet. In the past, the primary LZ for paragliding pilots has been LZ1. In 2012, I decided that LZ 2 is not too difficult to reach and now use it as the primary LZ for the Paragliders. LZ1 is large, but the combination of the altitude density and high trees cause it to be more challenging. LZ 2 is about 1/4 mile further from the ridge, but there are far fewer trees surrounding it and it extends way further to the north and is much larger. When flying to LZ 2, it should be easy to confirm if you have enough altitude to make it. If not, LZ 1 is a great backup LZ. It is best to be familiar with both LZs prior to flying and to have a good plan for your landing approaches. The lift in front of the rim can be incredible. It is generally described as “glass off” flying. Glass offs are a form of convergence that happens late in the day at mountain sites when the angle of the sun begins to lower. As the sides of the mountains see less sun, the air cools there and generalized lift results from air converging in the valley between the mountains. Hat Creek rim is flyable as a ridge soaring site in the late evening (when the winds die down to a safe velocity for paraglider pilots), regardless of whether or not a glass off is happening. Occasionally pilots will climb way out in front of launch, even 1/2 a mile or even more when the factors come together for a true glass off. Pilots have climbed to over 2000 ft above launch on such days. However, most of the time, you can have a great flight that is more like general ridge soaring with thermals that can get you an extra 500 – 1000 ft above the ridge. Landing at 3600 ft. with the common, near sunset, temperature of 90°+ (summer), it is more like landing at 6,000′ than 4,000 MSL! P3 rating recommended. P2 pilots should be sponsored by someone experienced with the site. Launch: High wind experience is a must for flying this site. The winds and thermals just 2 hours before sunset can be extreme. The paraglider wing can yank a pilot into the air the second it is pulled overhead and the pilot needs to handle this well. If the wing does not come up in a stable fashion, a quick abort is often the best option, much better than trying to force the launch to work. The typical flight at Hat Creek happens around 2 or 1 hour prior to sunset. Prior to that the winds can be blowing above 20 MPH. Hang Gliders can handle the stronger winds, but the most experienced Paraglider pilots wait till it dies down below 20 MPH. Newer pilots would be well advised to wait till it is averaging less than 15 MPH and be careful to time their launch between the stronger cycles. Above the main launch, just to the right as you face the launch, there is a cleared spot that works well for Paragliders. When the launch is crowded, experienced pilots should use this launch. Landing: LZ 1 looks large for paragliding landings. It is important to walk this LZ and see that the trees are 80 ft tall at much of the perimeter. Do not get downwind of these trees during your approach. The wind can also be switchy in the LZ, so watch the wind socks after arriving with some time to observe the wind directions and velocity. The normal high temperature and 3600 ft of the LZ make the air thin and airspeed is very important for final approaches. 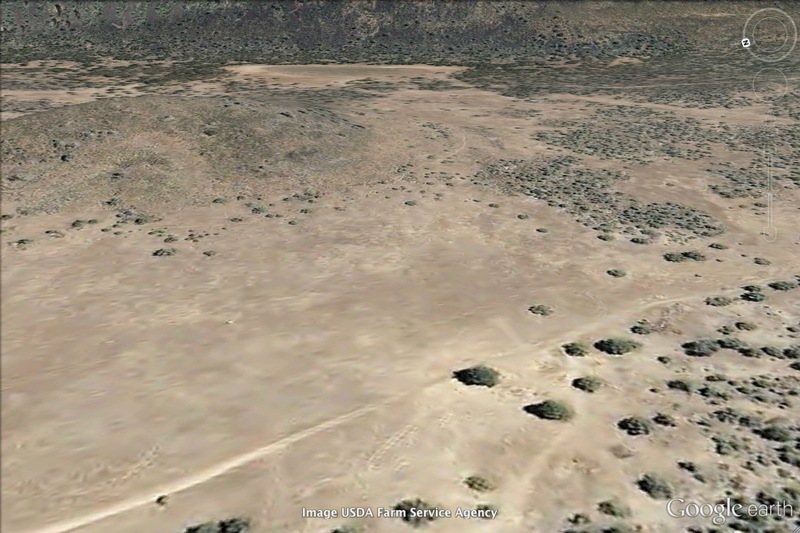 LZ 1 ( GPS coordinates – 40°50’18.97″N , 121°26’20.99″W ) The LZ has high trees (80 feet or so). If you do a figure 8 approach, you should keep just upwind of the tree line. Better yet, work down over the center of the LZ using figure 8s or just cruising around over the LZ and getting near the center (when you get down to just above tree height). While descending to this height, watch the wind socks and get an idea of the wind directions and changes. Then begin a downwind toward the LZ perimeter (when you are nearing tree top level). You can now execute a D B and F (downwind, base and final) approach. If you hit lift on the downwind, you can extend the base leg or use Big Ears on route. If you get low on the downwind, turn onto base sooner. Execute the base leg parallel and upwind of the tree line. Keep good airspeed for your final, switchy winds and altitude density will make airspeed a valuable tool for your landing and flare. 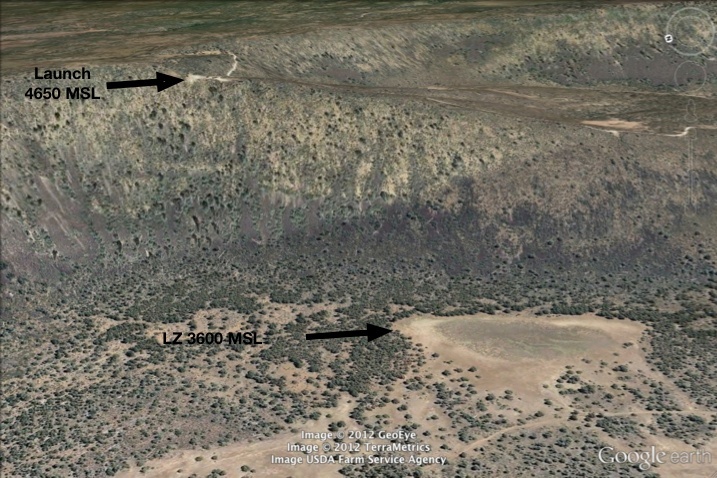 LZ 2 (GPS coordinates – 40°50.417″N 121°26.967″W) This LZ is about 1/4 mile past LZ1. There is a small hill between the two. It is much larger and does not have the high trees surrounding it. A standard figure 8 approach works fine for most pilots. General Landing Info: Pilots should be aware of other Hang Glider pilots or Paraglider pilots doing landing approaches at the same time. With this awareness try no to get in their approach pattern. The key to this is to fly predictably and have awareness of the other gliders approaching the LZ. If a glider is just above you, you can speed up your descent by using Big Ears to increase the vertical separation. If you are above another glider making an approach, you can fly Minimum Sink speed to help the separation. Less issues with high tress and it is much bigger, stretching from North to South. Because of the lower trees, a standard figure 8 approach will work for almost all directions of wind. For paragliding reaching LZ2 should not be too difficult if you are 300+ ft above the ridge. You might be able to reach it from lower than this, but it is nice to have some extra altitude. LZ 1 is becomes a primary if you get low. After taking off, if you are not getting up and are near launch and getting more than 200′ below launch, reaching the LZ can begin to get difficult. If you are north of launch and have descended or are near launch level, it is prudent to move back toward launch and have the plan that if you get lower than 200′ below launch to head out for the LZ. The tradition in the past was for LZ1 to be the primary for PG pilots. LZ2 has always been the primary for HG pilots as it is easily reachable, is much larger and does not have the tall trees at the perimeter that LZ 1 has. I decided to change my primary plan to have all students land at LZ 2 on the last mountain trip I did in July of 2012. I suggested to all of the students to try to head for the LZ at 300 or more over launch and that they should all make it with plenty of altitude for LZ 2. About 6 or 7 graduates and students all made it to LZ 2 and had great landings. As a result of this experience, I now use LZ 2 as a primary, but brief all pilots on landing approaches into LZ 1 should they not have enough altitude to safely reach LZ2. As you fly past LZ 1 on the way to LZ 2, it is easy to see if you have enough height to clear the little hill that separates the two LZs. If you are gliding toward LZ 2 and cannot clear this ridge easily, simply do a U turn back to LZ 1 and use it as a backup. http://www.hatcreek.info/ was in the past, the controlling group for Hat Creek. Their website has more information than I have here, my input is mainly about Paragliders. Recommended Rating: Intermediate with proficiency in restricted landing field, turbulence, and assisted windy cliff launch. Prevailing wind and Speed (summer afternoon): West to Southwest, 15 to 30mph. Setup Area: Smooth gravel with room for 20+gliders or more. Launch: West-facing slope. Plenty of room for assistants. Excellent for paragliding. Some nearby brush if a tip were to get too low. Cross Country Potential: Yes. It’s only eighty-eight downwind-miles to Lakeview’s Sugar Hill, a feat yet to be accomplished. Hang Gliding (further) LZ: The #2 LZ can be reachable on a soarable day. It’s a 7.0:1 glide away. Water: No., Shade: Limited., Toilet: Yes., Trash: No. Vehicle Access: Excellent gravel road. Cellular Service: Yes/No/Depends on provider. Spectators often gather just to the left of launch. Keep spectators back for your safety and theirs. Inspect all LZs before you launch. There is a porta-potty at launch. Site map and information is sometimes available in a box attached to the Forest Service sign at launch. We more often then not camp at Hereford Ranch and RV Park, when visiting Hat Creek. Rancheria Campground is also nice. Continue North on I-5 (travel 128 miles) to Redding. Hereford Ranch RV Park and Campground are on the right, shorty after you head down Doty Road. Continue N on 89/44. After you pass Old Station, continue about 8 miles further and look for Fireside Village / Doty Rd and a sign for Hereford Ranch Campground (on the Right). Exit Hereford Campground and turn right onto Doty Rd. and continue for just about 1 mile. About 3 miles on this road, it will “T” into a dirt road, Turn Left. You will now climb to the plateau that LZ 1 and 2 are on. 1 mile after turning onto this dirt road, you will see a sign on the left showing LZ 2 and a bit further LZ 1. LZ1 is just under 1 mile from this road, just follow it down until you arrive at the LZ (on the right). To go to launch, continue up this road about 2 miles and watch for an exit veering to the left near the top of the incline that climbs to the top of the rim. Below is a video of a flight from my first flight at Burney Mountain (July 27, 2012). Burney is about a 1 hr drive to the top from Hereford Camp, but is only flyable in the early AM hours. The LZ is at Burney Springs and is a little small, but should work for paragliding pilots that have solid landing skills (early in the day before any thermal activity begins). The launch at the top faces the LZ and with South winds of 10 MPH or less, pilots should reach the LZ OK. I would estimate the glide at about 4:1. I would recommend P3 skills to fly here, P2 with a sponsor. Burney Mountain Paragliding from Jeff Greenbaum on Vimeo.